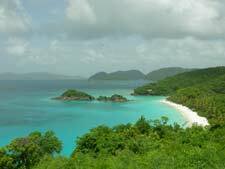 I have done my share of traveling throughout the Virgin Islands; however, I always seem to find my way back to my favorite island - St. John. 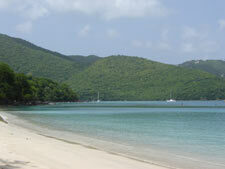 Only accessible via boat, St. John is about 75% National Park, has no cruise ships and the beaches are spectacular. Some like to refer to it as the "Martha's Vineyard of the Caribbean." It is hilly and has a bustling town called Cruz Bay with wonderful restaurants and great shops, but it is not terribly overcrowded at all. Day trips to other islands are also very easy – St. Thomas for golf and shopping is only a 20 minute ferry ride and Tortola is also only about 30 minutes by ferry. Villa CT TRE: 5br, 5.5ba, Pool. Great décor and just perfectly located, only a 5 minute drive to town. All bedrooms very suite-like, fully equipped and have their own outdoor areas. Villa CT CON: 5br, 6.5ba, Pool. Decorated in a really fun and interesting style. Perfect for a large group. Villa CT TAN: 4br, 4.5ba, Pool. Ideal for 4 couples and gorgeous, 180-degree ocean views. Villa CT GRA: 4br, 4.5ba, Pool. 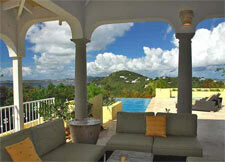 Easy access to Cruz Bay and really comfortable for 3 couples and 2 friends (in the twin beds). Back at Villa CT LAT, we lounged in the pool and soaked up the view. After a refreshing dip, we headed to the Starfish Market to get some groceries, wine and essentials for the next 4 days on the island. We returned to the house and jumped in the pool again and then hit the hay early, as we had the next day off to explore and see the beaches and of course, do some shopping. We started a bit late the next morning and headed to the Deli Grotto in Mongoose Junction to pick up sandwiches for our picnic at the beach. After that, we rented snorkeling equipment and headed up and around the bend to Hawksnest Beach. It was Sunday and I guess there is a party going on every Sunday on Gibney/Oppenheimer Beach. We could hear the music on Hawksnest as if we were in a nightclub- luckily it was great reggae and helped us ooze into the island rhythm faster. We snorkeled and "oohed" and "ahhed" over the fact that we were in such a beautiful place. After a bit, we decided to move a little further down the South Shore road to Francis Bay, one of my favorite St. John beaches because it feels almost deserted. Then, we went over Bordeaux Mountain and Centerline Road into Coral Bay for some cool, refreshing drinks at Island Blues, which also has the best breezes. Dinner that night was warmed up roasted chicken, potatoes and asparagus we had picked up at the market along with rum drinks and wine.